Map of the State of Texas From the Latest Authorities. 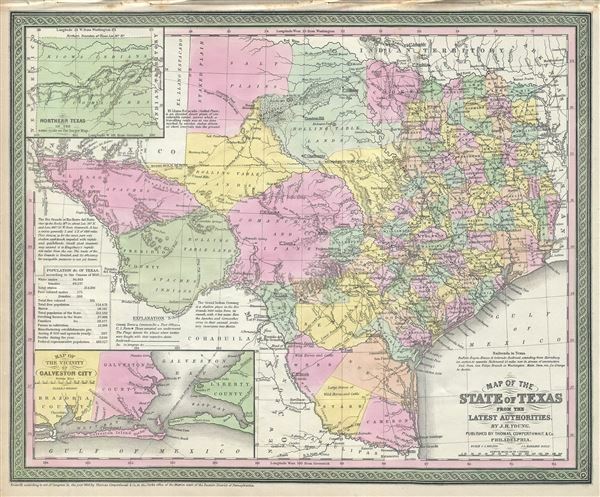 This is a fine example of S. A. Mitchell and J. H. Young's important 1854 map of Texas. Mitchell's map covers the entire state of Texas from the Red River Valley to the Rio Grande, and from El Paso to the Louisiana border. Texas's northern panhandle is included via an inset in the upper left quadrant. The whole is engraved and colored in Mitchell's distinctive style with green border work and vivid pastels. Political and topographical features are noted and color coded with elevation rendered by hachure. Though published as part of Mitchell's 1854 New General Atlas, this map is in fact unchanged from the 1850 state, as suggested by the copyright. Mitchell ordered this map re-engraved following the Compromise of 1850 in which, for monetary compensation, Texas agreed to surrender its claims to much of modern day New Mexico. Annotations in the left quadrants discuss the navigability of the Rio Grande for trade, the history of El Llano Estacado (Staked Plain), and note the route of Apache and Comanche incursions into Mexico. In the lower left quadrant there is an inset Map of the Vicinity of Galveston City. In the mid-19th century Galveston was one of the largest ports in the United States until devastated by a hurricane in 1900. Following the disaster, Galveston never revived as major maritime and commercial center.